Low-carbohydrate diets are popular to achieve weight loss. They involve restricting carbohydrates including breads, grains, rice, and starchy fruits and vegetables. There are many different types of low-carb diets with varying guidelines. Cheese, however, is typically allowed on all low-carbohydrate diets because cheese contains more fat and protein than carbs. Typically, on a low-carb diet, you reduce your carbohydrate intake to between 50 and 150 grams of carbohydrates a day, MayoClinic.com explains. Low-carb diets focus on choosing mainly lean proteins, nuts and low fat dairy products. You consume whole grains, fruits and vegetables in restricted amounts to promote weight loss. Proteins and healthy fats like monounsaturated fats are encouraged. You should consume saturated fats, found in most cheeses, in small amounts. Cheeses are low in carbohydrates, usually containing less than 1 gram carbs. A typical low-carb diet allows you to enjoy 3 to 4 ounces of cheese per day when following a low-carb diet. A 1 ounce serving is about the size of an individually wrapped slice of American cheese or a 1-inch cube of cheese. When you want to lose weight, you need to be mindful of the types of cheeses you choose. Cheeses contain different amounts of carbohydrates and saturated fats. When following a low-carb diet, choose blue cheese, feta cheese, cheddar cheese, cream cheese, mozzarella, Parmesan and Swiss cheese because they all contain less than 1 gram of carbohydrates. The University of Maryland Medical Center explains that on a low-carb diet, only 20 percent of your calories should come from saturated fat. 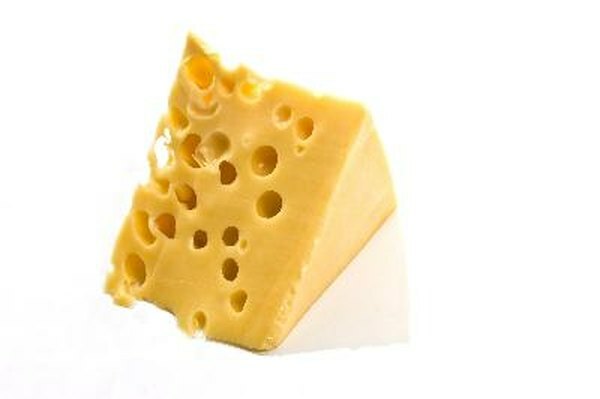 Therefore, low-fat cheeses are healthiest for most people. Although cheese contains fats and proteins, which are emphasized on a low-carb diet, cheese can still be high in calories. It is important that you watch how much cheese you are consuming. Too much of any food can lead to weight gain. Adding cheese on top of salads, pastas and eggs can be a healthy addition when done in moderation.